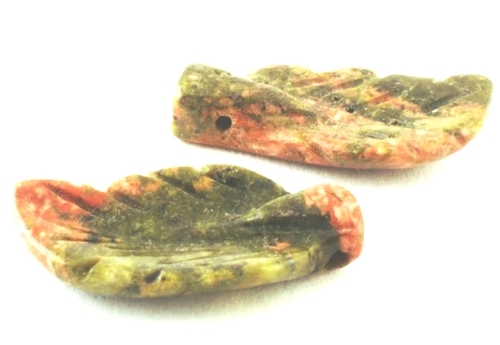 Price is per four of these unusual leaf beads. Beautifully carved detail - each measures about 20mm x 10mm x 4mm, top-drilled at the stem. Unakite brings love and creativity. Unakite consists of pink feldspar mottled on green epidote and quartz. Famous for finding the root cause of an illness – useful for conditions where the symptoms can’t otherwise be treated. It works by allowing the gentle release of long-term energy blocks, leading to an emotionally calm state. Also believed to stimulate the reproductive system, encourage pregnancy, and helping the healthy development of the baby in the womb. Some people even say Unakite can neutralize the harmful effects of electromagnetic radiation from television sets.